Kinesiology is a natural healthcare system that is based on eastern ‘energetic’ systems of healthcare and western knowledge of anatomy and physiology. George Goodheart D.C. developed Applied Kinesiology (AK) by applying the muscle tests of Kendall and Kendall with other therapies including the meridians of Traditional Chinese Medicine (TCM). This correlation of muscles to meridians was ground breaking and lead to the development of kinesiology as a complementary therapy. Other advances that he made includes applying the ‘Neurolymphatic Reflexes’ of Frank Chapman D.O. and the ‘Neurovascular Reflexes’ of Dr. Bennett D.C. to correct a weak muscle test. He also did research that indicated the correlation between specific nutrients and muscle tests. Applied Kinesiology has become a major therapy that is a postgraduate discipline in Chiropractic. It is now managed by the International College of Applied Kinesiology (ICAK). AK skills are developed and approved by the International College of Applied Kinesiology Board of Standards. These skills are refined from many disciplines including Chiropractic, Osteopathy, Medicine, Dentistry, Acupuncture, Biochemistry, Psychology, Homeopathy, and Naturopathy. Members of these professions share knowledge through the publications and conferences of the International College of Applied Kinesiology (ICAK). Goodheart then went about teaching his developments to other chiropractors. This group of chiropractors became known as the ‘Dirty Dozen’. Two of these were very important for the development of kinesiology, they are John Thie D.C. and Sheldon Deal D.C.
John Thie wanted to take the knowledge of Applied Kinesiology and share it with the layperson as a self-help method. He did this by developing the courses called ‘Touch for Health’. 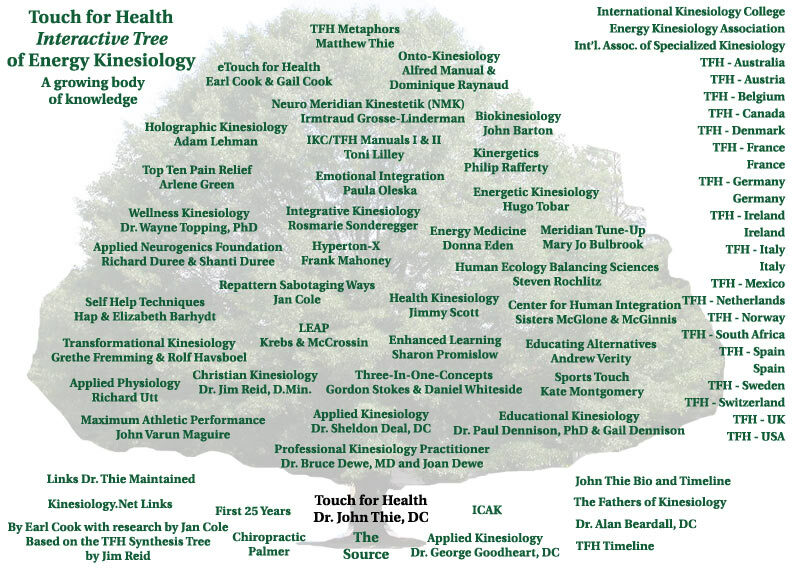 Touch for Health is taught in over 100 countries worldwide and reinforced kinesiology as a complementary therapy. Richard Utt went to Sheldon Deal D.C. as a client and through questioning and observation taught himself kinesiology and developed Applied Physiology (A.P.). Richard Utt developed several ground- breaking discoveries, the most notable being acupressure formatting and the A.P. hologram. Charles Krebs PhD was a student of Richard Utt. He then used some of Richard’s acupressure formatting of brain areas to develop the LEAP Brain Integration program for learning disabilities. He later added more acupressure formatting and applied the pathways balancing model developed by Hugo Tobar from Neuroenergetic Kinesiology (NK). Neuroenergetic Kinesiology (NK) is a modality of kinesiology developed by Hugo Tobar. It incorporates and vastly expands the acupressure formatting model of Richard Utt. He then developed the concept of identifying acupressure formats to each step of an anatomical or physiological pathway allowing the practitioner to follow the pathway to release stress. This idea became the underlying concept of the balancing protocols of NK. There are now extensive formatting systems in all areas of the human anatomy, physiology and energetic structures.